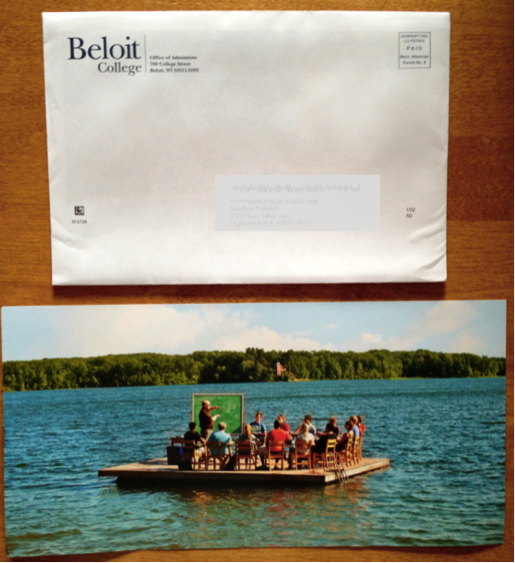 Ross's Law Marketing Blog: "College on a Raft" and Law Firm Marketing. 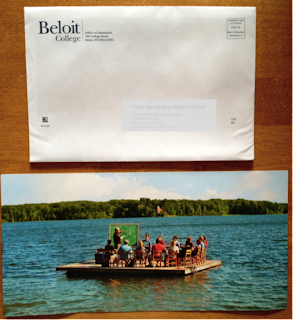 "College on a Raft" and Law Firm Marketing. My third son, Jonathan, is a high school junior. Darn smart kid, he's getting all sorts of daily mail from colleges all over the US. Good ones, great ones, many I've never heard of. Piles of college mail arrive every day, all offering the same thing. Smiling students -- sitting under trees, playing Frisbee on The Quad, attentively following a fascinating lecture in a small-classroom environment, challenging them to achieve more at their school. Higher Education has its own tired cliches, just like the legal profession's columns, gavels, handshakes, skylines, and smiling lawyers. Which one interested you? Today, for perhaps the very first time, something grabbed my attention. The one below, an oversized postcard from The College of St Benedict / St John's University. Finally, a school that understands that they're in the business of Marketing, not just Education. I'm not going to notice how highly ranked you are, or what your faculty-to-student ratio is, or how beautiful your campus is -- until you grab my attention and tell me a story. Crazy, right? College classes on a raft? I'll bet you want to learn more. I'll bet you'd like to flip it over and see what this is, why they're floating in the middle of nowhere. How they got ON that raft - did they swim there? Exactly. They're telling you a STORY. Good marketing tells a story. It grabs your attention, intrigues you, separates itself from the pack, then tells you a compelling narrative. It makes you want to learn more. It makes you remember them. And that's hard. But that's when it works. Someone at St Benedict knows what they're doing. They knew their first challenge is not getting thrown out with that day's junk mail. And on that score alone, this mailer is a big success. They have an entire section dedicated to Raft U. It's a great hook. I like these guys. I like this school. But I didn't ten minutes ago. Now I feel like I know something about them, something I like.When you go to the website, the raft is not on the home page, which is a shame, but a quick search turns up a bunch of links to "Raft U." Click here for the link. Or go here to take the tour. The online banner ad is here in the margin. How often do actually they hold classes on this raft? I'm guessing the answer is "Almost never." But that's not the point. The point is, I wouldn't have looked at St Benedict's mailer until they forced me to. Does YOUR firm's marketing grab your audience's attention? Force them to read your website? Tell a story? If it doesn't then trust me, it's not working. See more of their dozens of examples below. Make your firm's marketing that compelling, and watch the magic happen. Don't you want to see more? Learn more? 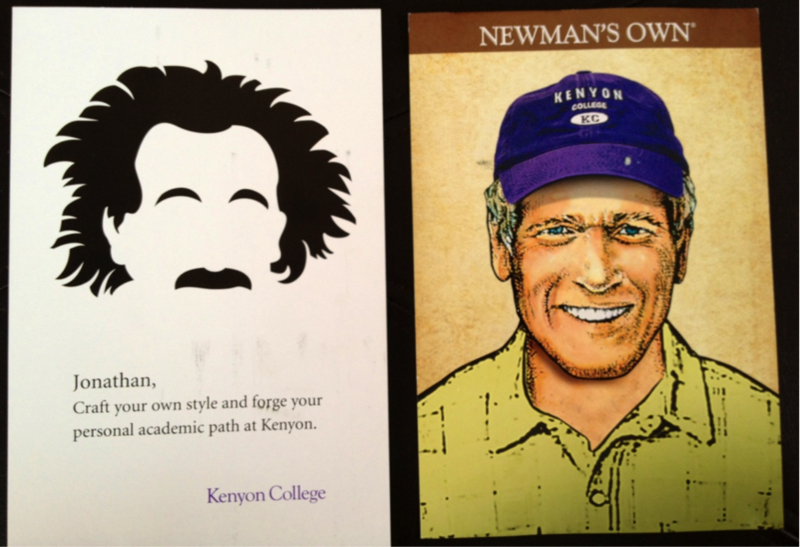 Update - Jonathan just showed me two more oversized postcards that grabbed his attention, a clever two-part series from Kenyon College, below. One has an illustration of Kenyon alumnus Paul Newman, with his story on the reverse, and another caricature of Albert Einstein. Nice job, Kenyon. All images (c) Copyright 2013 College of St Benedict / St John's University or Kenyon College.